Jurassic Journey at The Tower01493 852239work Theme ParkEnter Jurassic Journey if you dare! 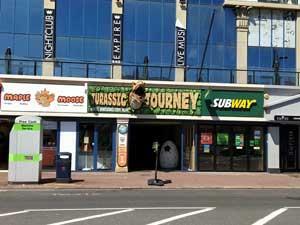 This all-new Great Yarmouth seafront attraction is an amazing adventure back in time to when dinosaurs ruled the earth. See dinosaurs like never before in rustic surroundings, as they roar into life, moving and breathing in front of you with a lifelike Stegosaurus, Velociraptor and T-Rex in this thrilling walk-through exhibit. Discover fascinating facts and work through the Primeval Hunt Sheet with your kids, get up close and touch real, fossilized dinosaur poo and dinosaur bones. Enter Jurassic Journey if you dare! 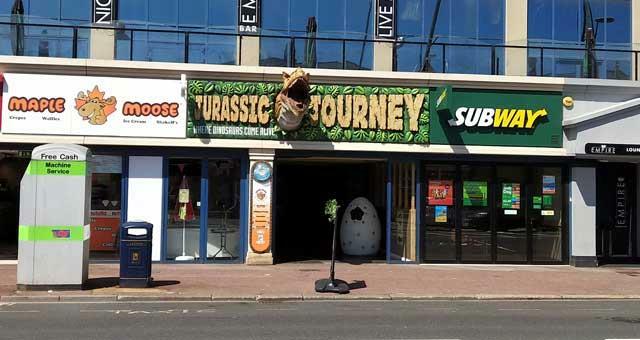 This all-new Great Yarmouth seafront attraction is an amazing adventure back in time to when dinosaurs ruled the earth. See dinosaurs like never before in rustic surroundings, as they roar into life, moving and breathing in front of you with a lifelike Stegosaurus, Velociraptor and T-Rex in this thrilling walk-through exhibit. Become a trainee paleontologist with Professor Possilfossil - what will you unearth in the scavenger zone? Dig for fossils and sharks teeth in the sandpit zone - it’s family fun of prehistoric proportions!